welcome to the forum darthvaper13. does the board stay powered on with a usb charger plugged in? also, will the mod connect to escribe? if it does, can you post a screen shot of device monitor with batteries installed and "pack voltage" checked? You did make connections to the JST connector to allow balancing the batteries? Its a DNA75. There isn't any JST balance connection. And the dual 18650s are wired in parallel. 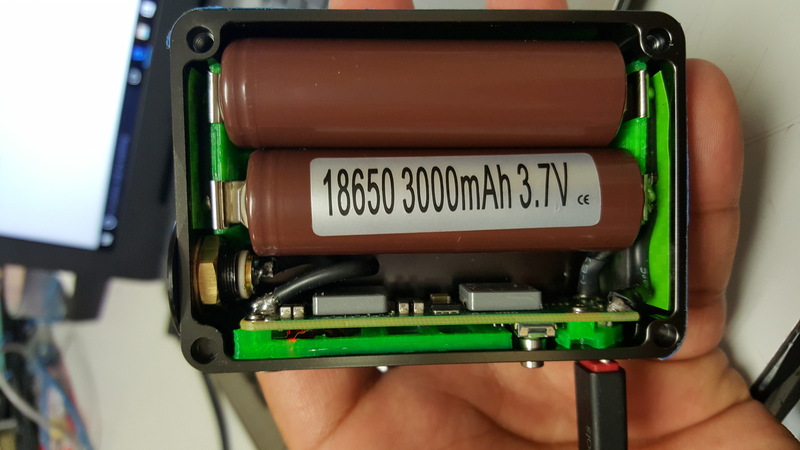 As far as the DNA75 is concern, it is one large capacity 3.7v battery. you have a dna 75 right? that board does not have balance taps. the dna 200 does. disregard awsum140's comment (sorry awsum140!). i dont want you to get confused. could post some pics of your wiring and board; front and back. Do you have a volt meter or a multimeter or something that can read the battery voltages (battery charger perhaps)? 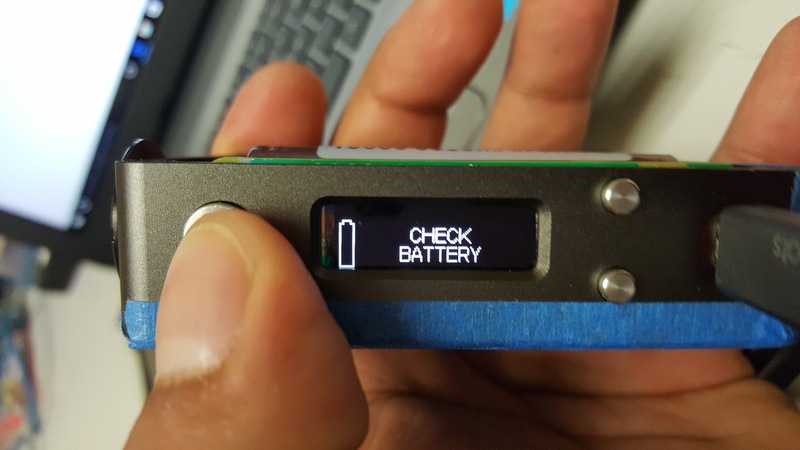 As check battery error means the DNA75 thinks something is wrong with the battery voltage. I can't see from the photo so excuse me it it is so, but the 510 -ve needs to connected to the battery -ve or board GND. i would check your battery sled leads with a volt meter. escribe is saying you only have 0.90v's going to the board, no where near enough. recheck what kind of voltage you have at the board. you have a poor connection somewhere. how do you have your 510 wired? looks like only one wire and in the wrong place. as VB said, it's hard to tell from the photo. the 510 positive (spring loaded pin part) goes to the "out" of the board. do you have a ground wire from the 510 to the board? Yes the spring pin is wired to out and and the ground is there. ok good. back to the issue at hand........you're losing power somewhere between the batteries and the board. whether it be the the sled terminals, wires soldered to the terminals or where the wires are soldered to the board. 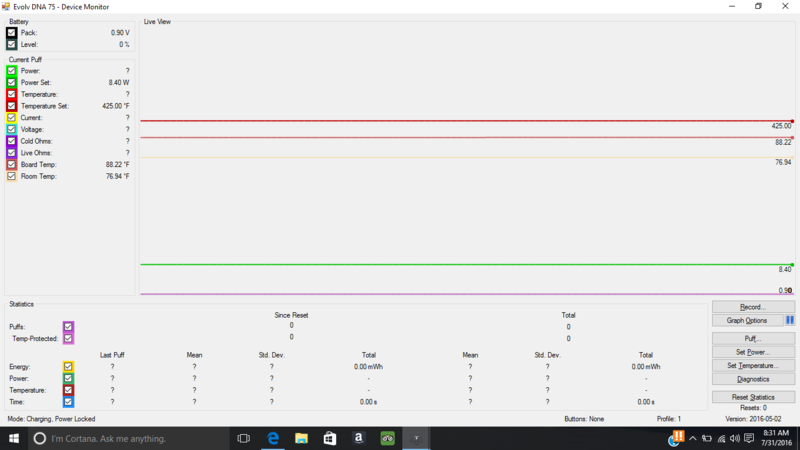 does the voltage change in device monitor if you spin or wiggle the batteries while they're in the sled? figure that out and your problem should be solved.